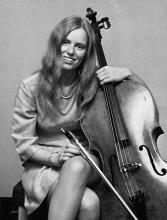 The JdP Music Building was built in memory of the world-renowned and much-loved cellist Jacqueline du Pré (1945-1987). Born in Oxford in 1945, she studied under William Pleeth and made her debut at Wigmore Hall at the age of 16. The following year she gave her first performance of Elgar’s Cello Concerto – a piece she played throughout her career to great acclaim. Aged 20 she recorded the concerto with EMI, which propelled her onto the international stage; she subsequently worked with several prestigious orchestras, including the Berlin Philharmonic. In 1971 she began to lose sensitivity in her fingers and other parts of her body, and was later diagnosed with multiple sclerosis. Her last performance was in February 1973 and she died on 19 October 1987 aged 42. Jacqueline Du Pré was an Honorary Fellow of the College and the building is a memorial to her.